The Walt Disney Company is rich with so many wonderful traditions, one of my favorites being hand-drawn animation. While there have been many changes and advancements in technology that have changed the way we create our animated classics, the beautiful tradition of hand-inked and hand-painted cels is still very much alive at Walt Disney World. In 1997, the Animation Gallery at Disney’s Hollywood Studios began creating the beloved Ink & Paint collection, which is available exclusively at the Animation Gallery. 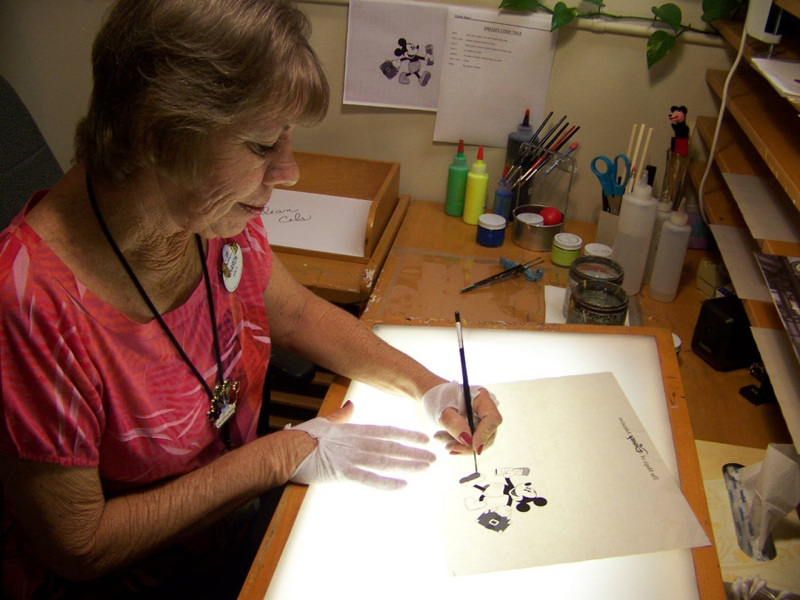 Each cel in the collection is inked and painted by hand, by our talented design team whose passion for the craft helps to keep one of our most treasured Disney traditions alive. Just last week, I had a the fortunate opportunity to sit down with Ink & Paint Artist, Sharon Vincent, who has been with the Ink & Paint team at Disney’s Hollywood Studios since the beginning. Sharon gave me a whole new look into the delicate world of hand drawn art, which I am so excited to share with you today. Dara: I’ve heard that you’re an expert when it comes to Ink & Paint Animation cels. How long have you been Inking & Painting? How did you get involved with such a delicate and intricate craft? Sharon: My father was a very talented artist, and began teaching me when I was about 5 years old. He loved many different forms of art, and encouraged me to be versatile, and to always try and “learn something new.” In 1985, while reading the newspaper, my Dad spotted an article about a new art studio that would be relocating to Central Florida. He said, “Hey, this is right up your alley.” So, as soon as this company arrived, I went and applied for a job, which was at the independent Ink & Paint Studio. I was very excited and honored when in 1989, I was invited to join the Walt Disney Feature Animation opening crew, here at the Florida Studios. Dara: A lot of people don’t know what it takes to create a Hand-inked and Hand-painted Animation cel. Can you walk us through the delicate process of creating an Ink & Paint cel? Sharon: The term cel is short for Celluloid Acetate, a transparent material which is used for hand-painted animation frames. Here’s a quick synopsis of what it takes to create a Hand-inked and painted cel. Once we finalize the rough concept art it is sent through a final clean-up stage. During this process the line work for the characters is refined, insuring that each individual line is fluid and tapered allowing us to breathe life into the characters. The character’s line work is typically applied by traditional hand-inking (using an old fashioned quill pen nib), or by a silk screening process on the topside of the cel. Once the line’s are complete, the cel is flipped over, and the paint is applied by hand on the reverse side, allowing us to achieve clean lines when flipped back over and viewed from the front. The most common technique used for animation painting is known as “floating”. This is where paint brushes are in contact with the paint only, never touching the surface of the cel. Our last step is to ensure that each cel is complete, has been beautifully painted and has dried thoroughly, so it’s ready to hang in your home. Walt Disney in a cel, from the Studios’ Ink & Paint Collection. What can you tell me about the creative process you and the team went through, to dream up the cel? Is there anything about the new cel that you want share with our Disney Parks Blog fans? Sharon: We start with a brainstorming session and then build a story around it, add a little character and viola! We all felt it was time to create another vintage cel, highlighting everyone’s favorite, Mickey Mouse, but this time taking it all the way back to 1928, as my teammate Jim Bonserio, suggested. 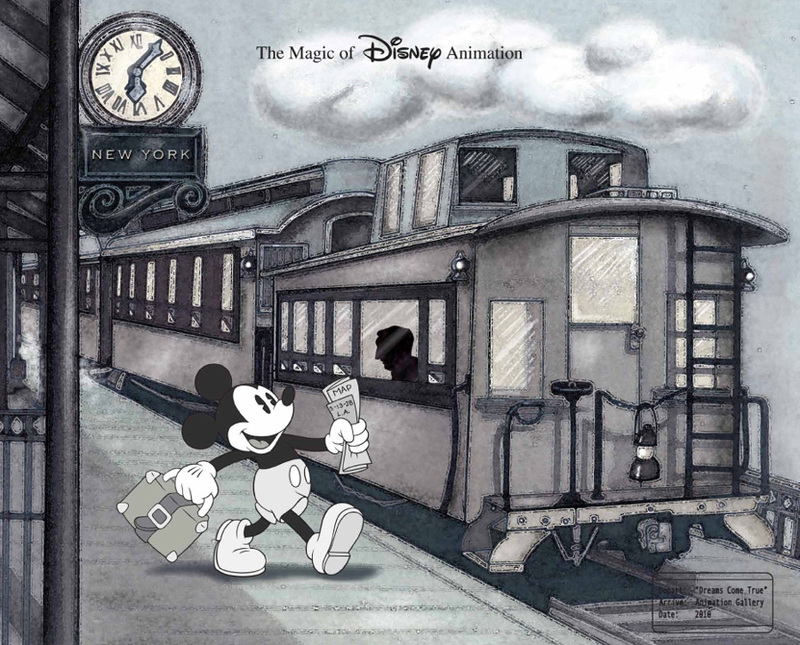 This particular cel tells a heartwarming story, of how “Dreams Come True” and recounts the legend of when Walt dreamt up the idea of Mickey, on his train ride from New York City to Los Angeles. Can’t make it to the Studios but would love to add the “Dreams Come True” Cel to your collection? Call Walt Disney Event Services at 407.827.7600 to order your cel, or visit ArtofDisneyParks.com for more information.